WooCommerce is a free and most popular eCommerce plugin for wordpress, it is really a useful plugin for eCommerce businesses. This plugin was created in 2011 and is now used by thousands of eCommerce websites worldwide. It is an easy toolkit that lets you sell anything you want online. Imagine your WooCommerce shop contains thousand’s of products and if you don’t even specify any of your products price or some of the products running out of stock, what actually the customer will do? just leave a message from your site contact us page, but it is a tedious task for the shop owners to find out the query belongs to which product. In order to add our contact_form7 (additional) tab to “woocommerce_product_tabs” Lets add a filter. as a result it will create a new tab with name “Enquiry” if you prefer a different name then you can update it on title. Then define the callback function(wc_product_contact_form7_tab) that will echo the contact form. 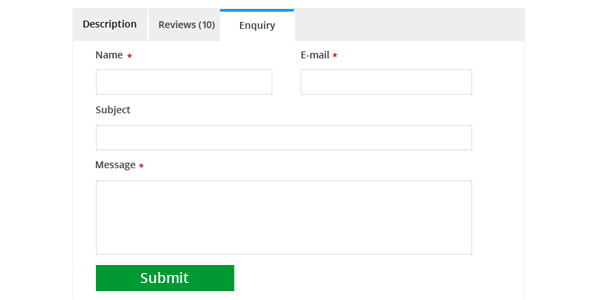 Most of all already using Contact form7 as a Enquiry form but this article will help you to use the same contact form7 as a product enquiry form.